樊鹏飞, 杨晴, 毛宇嵘, 胡强, 汤后林, 李健, 罗雅凌, 汪芬, 占焕庆, 臧思明. Fan Pengfei, Yang Qing, Mao Yurong, Hu Qiang, Tang Houlin, Li Jian, Luo Yaling, Wang Fen, Zhan Huanqing, Zang Siming. Fan Pengfei, Yang Qing, Mao Yurong, Hu Qiang, Tang Houlin, Li Jian, Luo Yaling, Wang Fen, Zhan Huanqing, Zang Siming. Follow-up of people living with HIV/AIDS by primary health care institutions in rural area of Jiangxi province[J]. 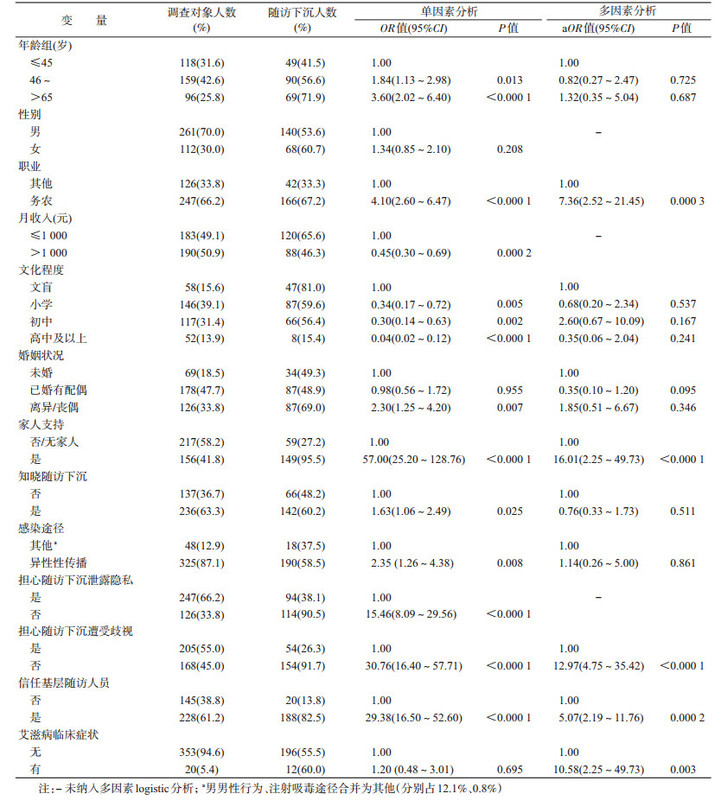 Chinese Journal of Epidemiology, 2019, 40(3): 346-349. Abstract: Objective To understand the current status of follow up of people living with HIV/AIDS by health service at grass root in rural area of Jiangxi province and related factors, and provide references for the promotion of the follow up by grass root health service. Methods People living HIV/AIDS aged ≥ 18 years and diagnosed before 31 December 2017 in 6 townships of Xinjian, Yushan counties and Guixi city were included in the study in Jiangxi province. They had been followed up for more than one time after the first epidemiologic survey. The information about their demographic characteristics and HIV infection status were collected by using self-designed questionnaire. Univariate and multivariate logistic regression analyses were conducted to identify the factors that influencing the acceptance of follow up by grass root health service. Results Of the 373 surveyed HIV infected subjects aged (53.06±16.15) years, 261 were males (70.0%, 261/373). Among the surveyed subjects, the illiteracy and people who received only primary school education accounted for 54.7% (204/373). The rate of follow up of the HIV infected subjects by grass root health service was 55.8% (208/373), and those through heterosexual contact were 58.5% (190/325). The multivariate regression analysis showed that the acceptance of follow up by grass root health service was higher in those who were farmers (OR=7.36, 95% CI:2.52-21.45), had family support (OR=16.01, 95% CI:2.25-49.73), didn't worry about discrimination (OR=12.97, 95% CI:4.75-35.42), trusted health care provider (OR=5.07, 95% CI:2.19-11.76) and showed AIDS symptoms (OR=10.58, 95% CI:2.25-49.73). Conclusions The performance of follow up of people living with HIV/AIDS by grass root health service was well, suggesting it is a feasible management model. Being famer or not, family member supporting or not, worry about discrimination or not, trusting health care provider or not and showing AIDS symptoms or not were the main factors influencing the acceptance of follow up by grass root health service. 中国疾病预防控制中心性病艾滋病预防控制中心, 性病控制中心. 2018年第1季度全国艾滋病性病疫情[J]. 中国艾滋病性病, 2018, 24(5): 431. 王丽艳, 秦倩倩, 丁正伟, 等. 中国艾滋病全国疫情数据分析[J]. 中国艾滋病性病, 2017, 23(4): 330-333. 王召乾, 南磊, 孙研, 等. 凉山州乡级艾滋病综合管理模式的效果和存在的问题[J]. 中国艾滋病性病, 2013, 19(6): 434-435. 李自钊. 河南省基于农村社区的艾滋病综合防治模式探讨[J]. 中国艾滋病性病, 2010, 16(4): 408-410, 416. 曹广华, 支玉红. 农村社区HIV感染者/AIDS病人分级管理模式探讨[J]. 中国艾滋病性病, 2007, 13(3): 270, 267. 孔祥生, 奚菊梅, 苏锦, 等. 农村地区HIV感染者/AIDS病人县、镇、村三级随访模式建立[J]. 卫生软科学, 2011, 25(1): 67-68. 孟向东, 张新刚, 李志和, 等. 吉林省农村地区实行HIV/AIDS患者综合管理模式[J]. 中国艾滋病性病, 2006, 12(6): 563-564. Office of the State Council of China. Notice of the general office of the state council on printing and distributing the 13th five-year action plan for containment and prevention of AIDS in China[EB/OL]. (2017-01-19)[2018-09-01]. http://www.gov.cn/zhengce/content/2017-02/05/content_5165514.htm. Health Commission of Jiangxi Province. Guidance on management of follow-up of people living with HIV/AIDS by primary health care institutions[EB/OL]. (2015-10-19)[2018-09-01]. http://www.jxhfpc.gov.cn/doc/2015/10/19/80569.shtml.